Hotplates & Stirrers There is 1 product. Large , backlit LCD display. Ceramic work surface, 6.5 x 6.5 in. Safety LED indicates hot surface. Control actual temperature (with optional probe). 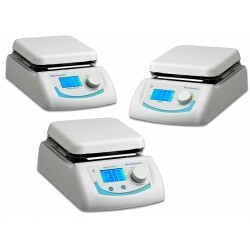 Three models: heat-stir, heat only or stir only.